In the early eighties there were some quite good hard/heavy bands in Holland. Picture, HighwayChile, Helloise, Sword, Vandenburg, Bodine, Hammerhead, Vengeance and another one was Martyr. Martyr started in 1982 and released their first official 7-track EP (with an intro and outro) in 1985. Back then the (Dutch) press was very excited and a live appearance of the band was always a party for the ear and eye. Their popularity was growing fast and with songs such as "Speed of Samurai" they had a real killer. Their second recording for the new label Metalloid Records had to be their break through record, but it did not happen. Due to lack of promotion and distribution the record was hard to get and the big success failed to come. After some member changes it did not last long before the band quit. After playing one gig in 2001 at the Heavy Metal Maniacs festival, it still lasted over 4 years until they re-united definitely. After playing a lot live, they signed a deal with Rusty Cage and now here is their release. The double digipack contains a re-master of the debut EP 'For the Universe' and a new five-track album 'Fear'. Listening to their debut you can still hear that at that time the band had a lot potential. The rather fast tracks with Maiden and Saxon influences were rather good. With a for that time not such a bad low-budget production it still wouldn't be fair to judge them by today's standard. For metal fans that want to know what Martyr was like back in the eighties, it is a welcome gesture. Much more interesting is what the band stands for today. Has the new EP 'Fear' something to add to the metal scene? 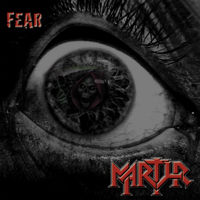 The new Martyr plays melodic heavy metal with crunchy guitars and good clear vocals of Gerard Vergouw. First song "The Most Evil" can not make a big impression on me, title track 'Fear' however does. The song has something threatening in it, it gives me a same kind of feeling as the song "Fear of the Dark" from Maiden. Third song "Different Kind of Rain" is a well written song with rather heavy guitars and again some good sounding vocals. In general the music has become more heavy, but more mid-tempo and less fast then back in the eighties. Only the last track has some more speed. If there is a place for Martyr in the overwhelming scene? It did not knock me out of the chair, it is not earthshaking, but it isn't bad either. Take a listen yourself.